The IBM® Rational® Publishing Engine 2.0 Beta is now available to try in the cloud on IBM Bluemix! Driving uniformity within the organization on document generation tools and capabilities. With Rational Publishing Engine 2.0 Beta, you can now assemble and generate documents that contain complex systems and software engineering data from a simplified web interface. Any user can generate documents from preconfigured reports with a single click. No coding knowledge or additional configuration is required. Report designers can quickly create reports from existing or new templates. Templates can be reused in other documents. Find the assets that you want to work with by tagging, pagination, sorting or searching. Example templates are provided with this application that you can use to quickly evaluate the beta by creating reports and then generating documents. Documents can be in Microsoft Word, HTML, PDF, or XSL-FO formats. To access the application, go to https://rpe.mybluemix.net/rpeng. Log in to the application with your account from IBM, Facebook, LinkedIn or Google. The Rational Publishing Engine application will not store or manage your user data. Select the check box that applies to your profile and click Approve. Click I Agree to accept the terms and conditions of the IBM Cloud Services Agreement. The Rational Publishing Engine application opens. Go to the Design page and click the Create Examples link. Now you have some templates, reports, and data source connections to work with. Since this application is available on a public URL, all reports and documents are private to the user. For the beta, you can only access reports and documents that you created, so you will need to design reports as well as generate documents. We encourage you to try the beta for yourself and provide feedback to rpe20_beta_support@wwpdl.vnet.ibm.com by the end of March. We look forward to your feedback on the design and usability of the system. If there are any use cases in your organization that is not addressed with the current system, please write to us at rpe20_beta_support@wwpdl.vnet.ibm.com. If there is an error while scheduling a report using the Generate Later action, check if the date is in the past. Currently, the browser support is limited to Firefox and Chrome. We may add IE10 support in the final release. 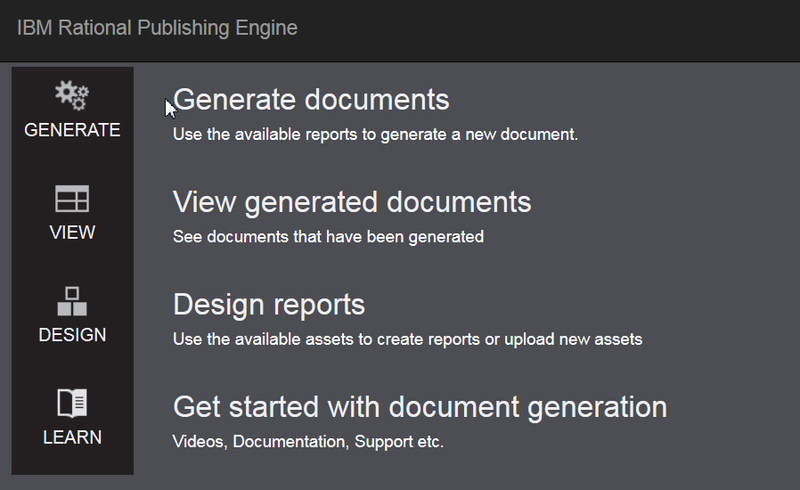 The IBM ® Rational ® Publishing Engine 2.0 Beta is now available to try in the cloud at https://rpe.mybluemix.net/rpeng. Everyday users can generate documents from preconfigured reports with a single click. No coding knowledge or additional configuration is required. The information in this document is for planning purposes only. The information herein is subject to change or removal without notice before the products described become generally available. IBM’s statements regarding its plans, directions, and intent are subject to change or withdrawal without notice at IBM’s sole discretion. Information regarding potential future products is intended to outline our general product direction and it should not be relied on in making a purchasing decision. The information mentioned regarding potential future products is not a commitment, promise, or legal obligation to deliver any material, code or functionality. Information about potential future products may not be incorporated into any contract. The development, release, and timing of any future features or functionality described for our products remains at our sole discretion. © Copyright IBM Corporation 2015. All rights reserved. Edit by author – Currently, the browser support is limited to Firefox and Chrome. We may add IE10 support in the final release. Hi Nithya, this looks very promosing with features that our end users are looking for. Can you comment on what the anticipated GA date may be? Hi Denise, The GA is end of 1H 2015.